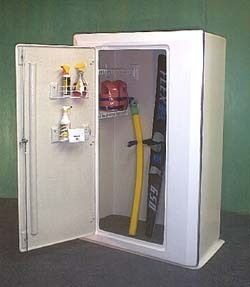 We are excited to offer the full line of Carvel Fiberglass Dock Lockers! Carvel is the standard in dock lockers. Most docks do not have a place for you to store and secure your valuable toys, supplies, boat parts, and cleaning supplies. 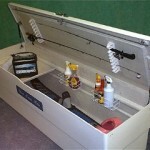 A lockable dock box will keep your items safe and dock clutter free! 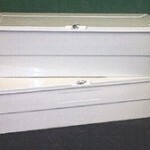 Please contact us for sizing, pricing and delivery options. 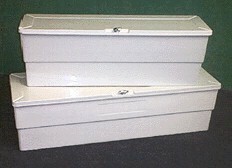 Can you still get the Carvel dock boxes? I haven’t been able to get ahold of them. We have 3 carvel dock lockers and have lost the keys. (actually we had a theft at the lake and our keys were stolen). We have the code but wondering if you could get keys to match. Thanks for your help!! 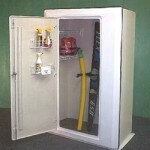 I am looking for a dock box that we could use in our car wash facilities and to add to our suppliers catalog. 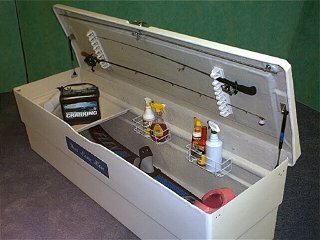 I like the looks of the long floor box but would need the lid rack to hold brushs not fishing poles. Is this possible? If you have questions on dock lockers, price, or availability, please call us: 573-673-5474. With the limited supply, details change frequently.